has some helpful recommendations for keeping your pet feeling safe and secure and happy. Certain candies are toxic and could prove fatal to your pets if ingested. So, no matter how much he begs or gives you “those eyes” do not share the goodies with your furry friend. Chocolate in any form is super dangerous for cats and dogs. Avoid any sugar substitutes, such as common artificial sweeteners. Be especially careful about anything containing xylitol. Although it is a natural herb, it is poisonous to animals. If you have kids, be vigilant about this message. Some pets are incredibly curious and resourceful, so be sure to stash any candy securely. Should you suspect your pet has ingested any candy, do not hesitate. Call the ASPCA Poison Control Center at 1-888-426-4435 immediately. As with any holiday, your decorations can be disastrous with pets. So, to avoid any mishaps decorate with your pooch or kitty in mind. Consider using battery-powered candles in your jack-o-lanterns and around the house. Be careful when stringing up lights; secure the wires. Not only could your pet trip, but they may even chew on them. While pumpkins and decorative corn are generally are non-toxic, your pet may experience some digestive distress if they munch on them. Make sure the costume fits properly. Loose outfits could get twisted or caught, causing injury. Make sure the costume does not limit movement, sight, ability to bark or meow, or breathing. Check to make sure the costume does not have any dangly parts or pieces that could be chewed off and choked on. Have your pet try on and wear the costume around a couple of days before the big night. If they hate they costume, consider a festive holiday-themed bandana or collar. Bring them dressed up into Naval Bagels for doggie bagels. Halloween can be a busy day, bringing a lot of unknown visitors to your home. So be careful during the excitement when opening the door so your pet does not dart out. And if you hit the streets for tricks or treats, make sure your pet’s leash is secure. Lastly, have your pet wear an ID tag, or consider microchipping. These are invaluable in finding a lost pet. 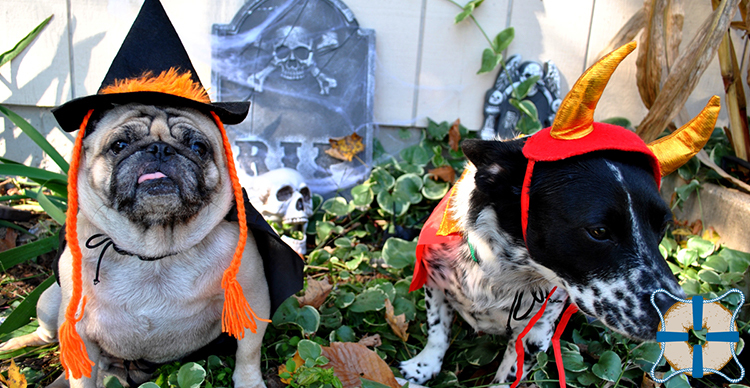 These tips make celebrating Halloween with your pet fun and safe. Naval Bagels invites you to come in and pick up some treats for your pooch! We make delicious doggie bagels that your pup is sure to love. They are made with wholesome, safe ingredients. The next time you are here enjoying breakfast or lunch don’t forget a bag of doggie bagels to have at home…your pooch will love you for it! Hope to see you soon…Happy Halloween from Naval Bagels!